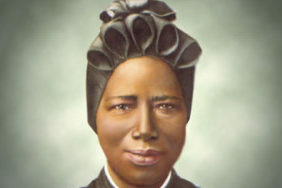 “The Lord has loved me so much: we must love everyone…we must be compassionate!” – Josephine Bakhita was born in Darfur, Sudan. Between 1876 and 1882 Bakhita was sold three times. She suffered extreme torture in captivity and eventually she was sold to an Italian diplomat who gave her as a “gift” to a friend who took her to Italy to act as a nanny to his children. There she was introduced to the Sisters of Canossa and became a Catholic nun. When she was told to leave Italy by her master she refused and took him to court to be able to stay free, and she won. The Bakhita Empowerment Initiative of Catholic Charities provides direct assistance and case management to victims of human trafficking. The program also aims to educate the community about human trafficking, as well as how to identify individuals who are being forced or coerced for the purpose of sexual exploitation or labor.